Keeping it simple and still being able to cook just about anything your tastebuds and curiosity call for may seem impossible, but actual is very doable. Recently, a reader of TSLL’s book asked the question, what is a simple list of supplies I should have in my kitchen? And while I immediately reminded her to check out chapter five of the book as well as this post, I noted to myself a few additions I wanted make, and so, I am sharing them in today’s post. Over the past two years I have been a curious cook in the kitchen. Now, not every recipe has turned out, sometimes my tinkering delivered less than desirable flavors, but I did discover some wonderful recipes and skills along the way and those were shared on the blog (more than 34 shared here on the blog in the past 24 months!) building my confidence when it comes to working with what you have and stepping away from the recipe more than I ever have before. Because of the fun I have had (it truly is a playground for me), I have organized my small, but open kitchen to work efficiently without excess. As I shared in this post/episode, it is entirely possible to enjoy eating every single day and love the results, and #3 of the list shared in that post speaks to keeping it simple in the kitchen regarding gadgets and supplies. What do I mean specifically by “love the results”? It’s twofold: visually and most importantly, physically (meaning a healthy mind and body). I have had to work on my discipline with the food that while teasingly tempting due to its sugary satisfaction as well as overly processed carbohydrates always leaves me feeling worse after the meal and uncomfortable in my clothing and my body. (Here is a post I wrote which dives into how to feed your body well.) However, these types of food taste sooooo good. ARGH! The issue I always had was not knowing what my options were that could taste equally delicious and be simple to make in the kitchen at a moment’s notice. Beginning last summer and continuing even moreso into this spring and summer, I have done my best to try new ingredients that offered flavor and satiate my appetite without leaving me feeling *ugh* (seven salads alone have been shared) and have been pleasantly tickled with the results. The key is having the right ingredients stocked in the épicerie and having the proper tools to perform the tasks necessary. Let’s talk about the only tools you need to cook well for your tastebuds and make the most of your time. It truly isn’t that complicated, so long as you know what and why you have what you do in your shelves, alongside your stove and in your drawers. Recently Bon Appétit wrote a piece about the necessity of a large cutting board on their new sister site Basically, and I wholeheartedly agree. As someone who has a large Boos in my kitchen (found at a garage sale years ago for $10 – who gives that up??? Whoever it was, thank you! ), I have sometimes taken for granted how handy having a large wooden space to chop, dice and organize my ingredients is until I travel and am working in another kitchen with a small, flimsy plastic sheet of a board (I still don’t understand those – they move on me, I’ve almost cut myself – not a good thing). Needless to say, since I travel with chef’s knife now, it has been tempting to want to take along my own cutting board as well, but that might be a little much. The benefits of a large cutting board enable the need for excess bowls and plates for what you have prepped as you can keep more than one or two items on the board. Some people prefer to have a separate small cutting board for garlic and onions due to their aroma, which makes sense. I have never done this, but I can see the logic to separating the smells if that is important to you as a cook. I will share that I do have two boards, one that is large (as I shared above) and a smaller one that sometimes acts as a tray for food to be taking out to the table for an appetizer, etc. As well, when two people are working in the kitchen, it is nice to have two cutting boards for both people to work simultaneously. I am repeating myself with this item, but it is vital. This is the precise reason I travel with my own knife if I know I will be potentially cooking while I am away. Knowing my knife is sharp is a priceless peace of mind only those of us who have cut themselves quite severely due to unsharpened knives will know. My knife, as I share in TSLL Kitchen Shop, is a Wüsthof with a wooden handle which I love holding in my hands. I also have a good serrated knife and pairing knife, and that really is all you need. There is no need for a block of knives. Having a set of steak knives is absolutely understandable based on your household’s eating regimen, but save the money that you would have spent on a block of knives and purchase one top quality chef’s knife. It will make a world of difference in your experience in the kitchen. Again, an investment, but they will last your lifetime and beyond. As I shared in this post, Mauviel is a brand I use and would highly recommend, but there are many other top quality options. In fact, my mom found a set of four graduated sauce pans at a thrift shop, purchased them for $50, cleaned them up and gave them to me for one of the best Christmas gifts I’ve ever received (the Mauviel sauté was from her as well – she knows my predilections, non?). You can see one of them here in this recipe. All-Clad is the continued recommended brand by top chefs, but use what you can afford. As I said, I am using the polished up copper set and they work wonderfully. Whether from Le Creuset or Staub, you will have a Dutch oven for life, but again, purchase what your budget allows. Whether using for risotto, stews, an entire chicken, the options are endless. From combining dough to making a gremolata for Spaghetti Vongole, a quality purchase will last for quite some time, and for slicing with the attachments, you have a versatile gadget that reduces the amount of cupboard space you would take up with multiple items doing separate, single tasks. Cuisinart tends to be the brand most recommended by chefs, but Breville is also a brand to check out. Now if you are an avid baker, you might want both. Currently I have a KitchenAid stand mixer, but have on my list to purchase, a quality hand-mixer for the meringues and whipped cream ingredients for some recipes. Again, these items will last a lifetime, especially the stand mixer, so choose a color you love as well as the style (slide or tilt) because you will always be using the same one. I share in this post the small items you will need to have within reach (a zester, fish spatula, etc.). I place mine in large white ceramic containers right alongside of my stovetop, so I can easily grab what I need while I am cooking. I love these particular ceramic bowls for mixing and preparation, but also for the aesthetic should they be stored somewhere to be seen. Having three usually is enough but depending upon how much you bake and cook, you may need more. For roasting vegetables, making bruschetta, and anything that requires a large flat surface, having two or three of these on hand makes for simple preparation and baking (use a sheet of parchment paper for easy clean up as well). You can pick them up at most any kitchen store, even Costco. Here is a pair for $36. Start with a pepper mill for freshly ground pepper as I did, but then consider adding a mortar and pestle to your set of tools as it will take the place of the pepper mill (although it’s always handy to have one for the simple topping of fresh pepper). From using for spices, pesto, and so much more, it won’t take up that much space and can be beautiful for open shelf decoration. Cole & Mason’s granite mortar and pestle comes highly recommended and for fewer than $40. However, take a look at a list of 11 options made of a variety of different materials (marble, wood, ceramic) that come ranked highly here. Placed right alongside my stovetop is a small tray of my two salts (kosher and sea salt) in small ramekins, pepper mill AND a glass dispenser for my olive oil and a ceramic dispenser for my balsamic vinegar (I found it at a secondhand shop for $5). Why do I have these two so handy? I use my olive oil daily, sometimes multiple times: in the morning with my egg for breakfast and for most dishes I make on the stove in the evening, and since my salad dressing of choice is nine times out of ten vinaigrette, I usually am using balsamic. If you are a baker and love making tarts or crust of any kind, this is the style of rolling pin I have fallen in love with since taking a French pastry class more than four years ago. It is hands on, you really feel the dough, and it just so happens to be French! I love cheese, and the box grater is stable, efficient, and it keeps your cheese in an organized spot until you are ready to use it in your dish. From the glass two to four cup liquid measuring cup to the four different sizes for dry ingredient measuring cups including measuring spoons (a suggestion from Patricia Wells in her new cookbook is to place all of the same size spoons on a ring – having multiple for cleaning purposes), having these seemingly small items is necessary for baking especially. Click here to see my list of items to have if you are a baker. After reading Ina Garten’s most recent cookbook, Cooking for Jeffrey, one of my favorite and most appreciated parts of the cookbook was her list in the back of her recommended tools for a starter kitchen and then a list for a professional kitchen. And what I noticed immediately was each list was not that extensive. The truth is, to cook well, it comes down to quality ingredients, practiced, good skills and just the necessary tools. I do hope this list eases your mind and gives you an idea of what to save up for that will be a worthwhile investment, most of which will last your lifestyle. While there is no doubt other items could be added to tailor to what you do in your kitchen, truth be told, you could do so much and maybe more than you ever imagined with just the items listed here. Happy cooking! Oh my goodness – I have just found your blog and I am in absolute heaven ! So happy to have been found! Enjoy perusing! LOVE LOVE LOVE THE IDEA OF PUTTING ALL MEASURING SPOONS OF THE SAME SIZE ON ONE RING. SO TIME SAVING. It’s it a great idea! I would have never thought of that had I not read Patricia Wells’ cookbook, but it makes complete sense. This is an excellent list. I love to cook, and the only thing on this list I don’t have are the copper saute pans. We do have a great selection of pots and pans though, including my Grammie’s cast-iron frying pan, which gets daily use in our house and is one of my most cherished possessions. The only thing I’d add to this list is my immersion or stick blender. I love our Vitamix, but trying to blend hot liquids is such a pain if you have to carefully do it in batches in a blender. My Cuisinart stick blender was the best $25 I ever spent. I use it for all kinds of things. Thank you for sharing both of this additions. 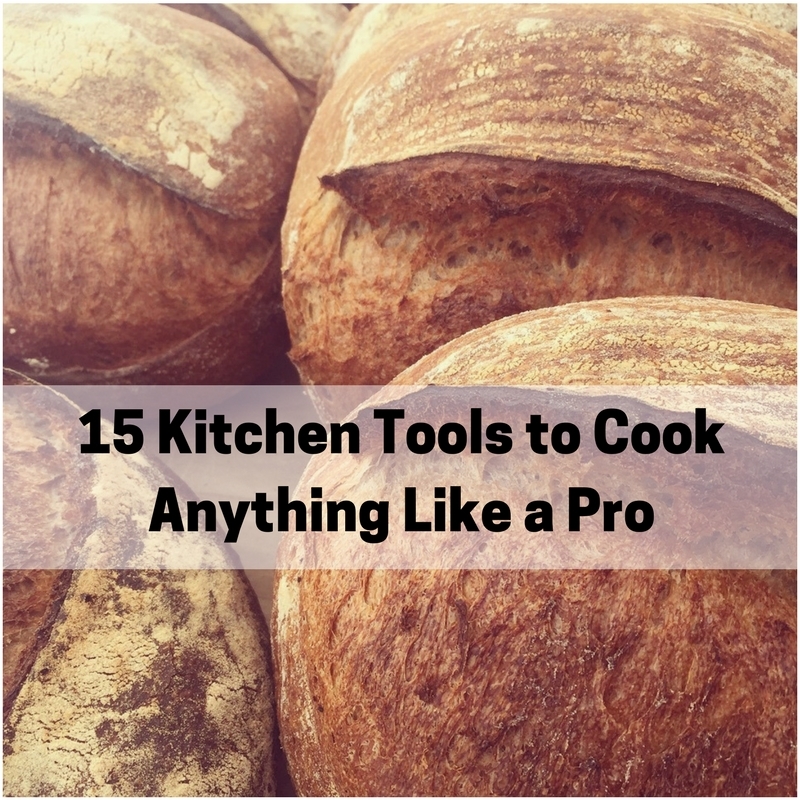 You are exemplifying perfectly how we need to tailor our tools to how and what we cook. Thank you! Love this post Shannon. I am a cook and I believe in a well-edited batterie de cuisine (keeping with the French week theme here!) I don’t like a lot of rarely used stuff cluttering up my kitchen! This is a great list. One thing that I would add that I find I use a LOT, are silicone flexible measuring cups. I give them to all my cooking friends and they all wonder how they ever did without them. So excellent for pouring batter, etc. Here is the link to them at Williams-Sonoma. I would add a kitchen scale. Most European recipes are given with weights, not volume. Once you get the hang of it, you wonder why anybody did it any other way. You can use one bowl for most recipes. I do have those flimsy plastic cutting boards. I like them because carpal tunnel syndrome means I can’t pick up anything too heavy without it dropping to the ground and they are nice and light. Also they fold/roll, so the chopped ingredients move obediently toward the pan. I just can’t do those movements with a heavy wooden cutting board (of which I have many nonetheless).